At one point all of my icons were nicely living in their corrals and a few months back they stopped playing nice. I do not think that it is related to an upgrade with fences but here is what I have done to try to fix it. Restore from a previous snapshot. Name a new fence and have all new icons automatically go there. Purge and reinstall using the batch file hosted on this site. I have tried just about everything I can think of as well as take advice from the forum here the last few months but finally, I am throwing in the towel. Below is a summary of my system configuration. Any more info will be gladly provided. Are you saying that Rules are not working? In fact, icons cannot be moved at all on the desktop. If you have the 'Auto arrange icons' (also in that image), it would do just that, auto arrange them. Settings are the same as in the image. What are the rules that you set? Only rule that I have is to put new files/folders in the 'New' fence. Is all new file set to go to desktop? I am asking because, from my observation, the rules only apply if you send those files to desktop. If, for example, you download something and it was saved into a download folder. Than that will not move into that Fence. but once you move that to desktop it will be send to that fences. Right - my language was a bit off. The fence is named New. A better name ( which I use on my desktop ) would be sort. All new icons in the later case go to the 'Sort' fence and then I place in the appropriate fence. Did not mean to imply that when a new icon is added a new fence would be created. That actually would be a nightmare! To speed this up a bit I am going to do the following. Uninstall fences using the uninstallation batch file. Eliminate any files in the user/AppData directory. Check the registry for potential Stardock/fences references. If there is anything that seems helpful let me know. Hopefully, I can get clean and meaningful logs. Is there a .config/.properties/.whatever file where settings and rules are stored? So I have removed the Fences3 application, deleted the AppData and removed all references in the registry, but the problem still persists. I have made a video and posted it on YouTube below. A description is included with the video. Let me know if there is any confusion or questions. Looking at your video. I notice you have black background. I cannot tell if you have fences turn on or off. And all those icons is inside a fence or its on the desktop. I am not sure how to help you. Please make another video with a wallpaper on and clear area between fence and desktop. At this point, fences is uninstalled and to the best of my knowledge all fences3 keys, as well as the AppData, is deleted. However, I believe that this is somehow an artifact that I may have missed. 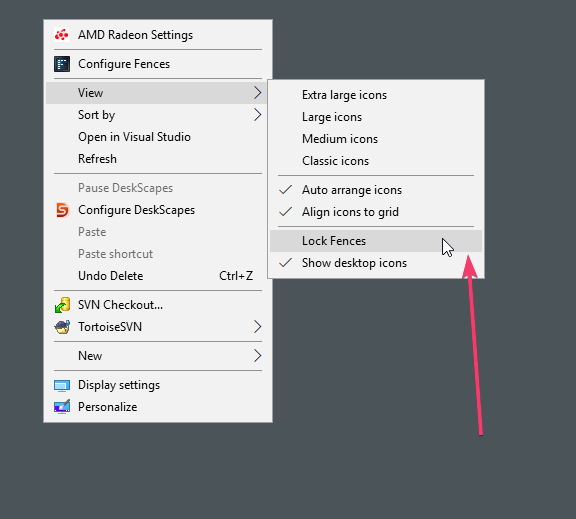 If I reinstall fences, I have the same result BUT I can create fences. And I can not put any of the icons in those fences. Ah.. got it. Since you already said that you have try purge and still the problem there. That shows it no longer fences problem. As far as I know purge will delete all traces of fence. I would suggest try the elevated command of sfc /scannow. You can google on how to do it. That will check if you have any corrupted files and it will replace it too. OK will do - I agree this does not seem like it should be a Fences problem at this point but may have been something you and your team have seen before. Ok ran the command and it returned with: Windows Resource Protection did not find any integrity violations. I did find this thread on Microsoft and it sounds like you are guiding down the same path - if so I will follow this and get back to you if I experience anything different than what this thread suggests should happen ( I have not read the whole thing but I am guessing it has a happy ending ). P.S. I am not sure what that emoji is or means but it seems right. Great. Please let us know your findings.